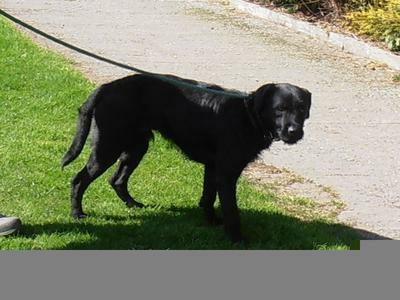 PERCY is a 2 year old Labrador Schnauzer Cross , he is neutered, unfortunately he is struggling to find his forever home. He isn't ok around some dogs and not ok with cats, so he is looking for a family with schnauzer experience . Can anyone help our lovely PERCY? Do you want to meet up with Percy? Hi, well Percy is doing fine! According to his Anibase records he was born in January 2011. I was born in January too which will make him seven next month! I've had him from end of December 2013, going on over 5 years now and he is a very bright intelligent pooch, gets at least 2 walks a day and longer walks either in Ecclesall Woods or the Peak District at weekends.Feel free to come and meet him! Please can I ask how Percy is doing now? What a lovely Christmas present hearing about Percy and how well he has settled in with you, John. We are delighted that everything has worked out for him and wish you all the very best for 2017. Hi Linda and Max, just an update, well it's 3 years to the week since I took on Percy! Such a lovely and bright intelligent pooch! He is loved by myself and all my friends, I don't think he believes he is five and a half however! Merry Christmas! Well Percy the Labrador Schnauzer cross has certainly found a home for life with me! He's been with me now for over 2 years and has turned out to be a loyal and loving companion. A real character, incredibly intelligent and has matured to accept most dogs with impunity. He has had to bearing in mind the sheer number of dogs he encounters on a daily basis in Meersbrook Park! A lovely dog!